These days there is a lot of buzz about software design patterns, and one of the most frequently asked questions is “How can I use some pattern with some technology“. In the case of Laravel and the Repository pattern, I see often questions like “How I can use repository pattern in Laravel 4” or nowadays “..in Laravel 5”. Important thing you must remember is that design patterns do not depend on specific technology, framework or programming language. A Repository mediates between the domain and data mapping layers, acting like an in-memory domain object collection. Client objects construct query specifications declaratively and submit them to Repository for satisfaction. Objects can be added to and removed from the Repository, as they can from a simple collection of objects, and the mapping code encapsulated by the Repository will carry out the appropriate operations behind the scenes. Repository pattern separates the data access logic and maps it to the business entities in the business logic. Communication between the data access logic and the business logic is done through interfaces. To put it simply, Repository pattern is a kind of container where data access logic is stored. It hides the details of data access logic from business logic. In other words, we allow business logic to access the data object without having knowledge of underlying data access architecture. Can you see now how much duplicated code would we have if we implement this for each data object? Sure, for small projects it’s not a big problem, but for large scale applications it’s a bad news. But it can be different, for example if component have configuration options, or migrations, etc. 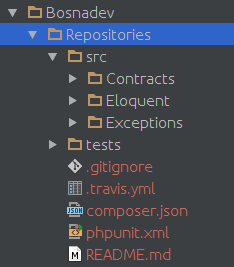 Inside src directory I have three other directories: Contracts, Eloquent and Exceptions. As you can see, the folder names are pretty convenient for what we want to put there. In Contracts folder we put interfaces, or contracts as we call them earlier. Eloquent folder contains abstract and concrete repository class that implements contract. In Exceptions folder we put exceptions classes. We are now ready to start with the implementation of this contract. Of course, each concrete child repository should extend our abstract repository, which implements RepositoryInterface contract. Now, how would you implement this contract? Take a look at first method. What can you tell about it just by looking at it? First method in our contract is conveniently named all() . It’s duty is to fetch all records for the concrete entity. It accepts only one parameter $columns which must be an array. This parameter is used, as its name suggests, to specify what columns we want to fetch from the data source, and by default we fetch them all. As you can imagine, these basic actions are just enough for simple querying. For larger applications you’ll most definitely need to make some custom queries to fetch more specific data set defined by some criteria. With criteria queries, you can now organise your repositories more easily. Your repositories do not need to be thousands of lines long. and just run composer update afterwards. Using repositories in your application have multiple benefits. From basic things like reducing code duplication and preventing you to make programming errors to making you application easier to extend, test and maintain. From architectural point of view you managed to separate concerns. Your controller doesn’t need to know how and where you store the data. Simple and beautiful. Abstract. You can find this package on Github, where you can check for latest updates and bug fixes. I also plan to add new features like eager loading, caching and some configs so stay tuned by staring the repository. However, if you want to contribute in the development just fork the repository and send PR. If you have any thoughts or suggestions, please let me know in the comment section bellow. See ya. Great article! I think you drew in my package http://bit.ly/1EuZWyu 😉 . I liked the changes you made . What about adding a dynamic finder to the Repository class? How do you cater a join table? I’m working on the part two of this tutorial which will cover eager loading, request criteria queries etc. Please tell me why the project is positioned as a “fresh air in the PHP” need same enterprise approaches? What benefits we get using the repository pattern with active record? How do you deal with Aggregates ? I’ve been trying to make Eloquent fit in an abstract repository pattern for more than a year. Ended up having Service class embedding several Repository classes, one for each model, which felt quite over engineered. Never found a satisfactory solution. Repository pattern is great, Eloquent is an awesome ORM, but I just feel the two don’t fit. TL:DR – Most Laravel implementations of the Repository pattern are fundamentally flawed, and it rarely brings any actual benefit. Got to agree with this, I’ve always struggled with relationships when trying to use the repository pattern – Something thats easy with Eloquent out of the box. I’ve also ended up building services utilising multiple repositories when relationships are involved. In it’s simplest form, if in your application you want to create a movie, and when when creating it, you want to add relationships to the Movie model, (adding gene, actors etc…) I end up with a MovieRepositoryService, that injects MovieRepository, ActorRepository and GeneRepository and end up using each of their individual create methods inside the MovieRepositoryService’s create method, to create what from a Domain or Business perspective is a “complete” movie. However this always felt like reinventing the wheel. Another issue I’ve always had with most peoples implementation of the repository pattern in Laravel is it neglects one of the main goals of the Repository Pattern. Your application logic should not be tied to your data source’s implementation. In the package described in the article an Eloquent object, or a collection of Eloquent objects is returned on all the ‘getters’. This ties our application logic to Eloquent if we use any of it’s specific features. What if we wanted to move to Doctrine, or one of our data sources changes to a web API supplying json or XML, or any other source not using Eloquent? One of the goals of the repository pattern is to enable you to swap out your data source, without needing to adjust your application logic for greater flexibility. To active this you can’t return implementation specific objects. You need raw data, either an array, or better yet, explicitly defined Entities that your repository populates from it’s specific implementation. At most an Entity should know what Repository to use to get any of it’s relationships, however, again, we arrive at the conclusion of reinventing the wheel, Eloquent already knows this, and can already do this – So for the most part, we’re just duplicating Eloquent’s functionality, again. Simply put, I’ve found most peoples implementation of the repository pattern in Laravel to be a fundamentally flawed exercise in trying to shove a large square through a small round hole. A design pattern is support to work for you, and solve your specific problems. If you find yourself questioning the pattern, or failing to see how you could implement it, or what benefit it’s going to give you, then the chances are it’s not the correct solution to your specific problem. What does implementing the repository pattern actually get you? Okay you get to resolve dependancies out of the IOC container via an Interface, which everyone is telling you is a good thing and how it should be done. By WHY is that how it should be done? Because it makes your application loosely coupled. You can change the object injected without touching the classes it’s injected to, but whats the point if the object it’s self ties you to an implementation? You’ve not loosely coupled your application at all, cause as soon as you inject anything other than an Eloquent object, and you’ve used an Eloquent specific feature anywhere in your application (Just once! ), it’s broke, so what was the point? Theres an awful lot of buzz around repositories at the moment – I’d encourage people not use it just because it’s the “in thing” to do, and actually think about what it’s going to do for you, cause in most cases, with Laravel at least, I believe the answer will: Nothing. I find myself wondering the same. How would you implement an actually loosely-coupled repository pattern, allowing for swapping – for an example – MySQL+Eloquent with MongoDB+? Thanks for you response, whilst it’s been a while since my original comment now, my overall opinion remains the same. Laravel as a framework is not suited to the Repository Pattern, and this basically comes down to a decision of Taylor’s when he designed and built the framework. The Doctrine library (Especially when bundled with Symfony2) is an excellent example of a properly implemented Repository Pattern, but this is due to the underlying differences in design. Doctrine is a Data Mapper implementation of an ORM, fundamentally different to Eloquents Active Record implementation. The Data Mapper pattern strongly complements the Repository Pattern, and Repository generation comes as standard with the Doctrine package as a result. There are ton’s of useful articles on Data Mapper vs Active Record for ORM’s if you want to learn more about the differences. Let me know if you have any more specific queries! I’d strongly suggest not using RepositoryInterface nor an abstract Repository class. Let’s talk abstraction through classification first. When you declare a RepositoryInterface, you are saying that all children of that interface (either abstract or concrete) will “be a Repository”. But Repository is a pattern, not a classification. So being a pattern has no real meaning but the motivation behind the pattern itself, that will be communicated through the name or namespace anyway. In other words, “being a Repository” could be conveyed by naming a class “FilmRepository” without the need for a classification, as being a Repository is fullfilling a certain pattern’s motivation, not being part of a certain group of things. Now, let’s talk about abstraction through generalization. The way your blog post starts, it’s clear that you don’t have a real motivation of generalizing: you start off with a general idea, an interface, but you don’t really have use cases where this general idea came from. You assume that all children of this interface will need to provide at least those behaviors, and that’s where everything starts to fall apart. Generalization – or any kind of abstraction – shouldn’t start through assumption, it should (as Kent Beck says in XP) be used when it provides simplicity. By adhering to your interface, I’m forcing myself to some specific behavior, assuming I’ll need it in every Repository I ever need, and in exactly the way you created it. The comments you received are a strong hint towards that: people start wondering how they’ll solve their specific problems whilst also adhering to your contract. That’s because they don’t really need your contract, but they’re forcing their minds to it, and that created unnecesary complexity. Now, let’s talk about your abstract class Repository. Here you decided to provide some implementation to the mix, because Eloquent behaves pretty much the same way in every class that inherits from it. This will bring a plethora of problems, and I can speak of them with confidence: I’ve done multiple projects with base Repository abstractions and Eloquent, and I’ve moved away from both. First off, and I think this is the most important one, you’re missing the point of using an Active Record. AR brings a lot of power, flexibility and speed at the cost of having multiple responsibilities in those objects. If you use AR in its full potential, you’ll be able to access your data in a more flexible way, and you can build over it without the need for collaborators. Now, this is not againt the Repository pattern per se, but against a generic abstract Repository that does some things out-of-the-box. The next thing that worries me is reuse through inheritance. Although we do it in Eloquent context, I strongly advice against any code reuse through inheritance: Always reuse through composition and collaboration. What if I need to do something slightly different on find() ? You’ll probably call parent::find. Then, if you add up a layer (say, cache, for example), you may end up doing multiple parent calls, and tracing that will be horrid. And don’t get me started on testing it! A “common way to access Eloquent models” could be abstracted out to its own class (not abstract). This could help CRUD app makers in having standard access to any Eloquent model without worrying about exactly what it does. A FilmRepository could use this CrudQueryBuilder (I’m just throwing names here) as a collaborator to have generic access, without being coupled to it (or it’s methods’ signatures) through inheritance. I do recommend declaring interfaces for each specific repository implementation. a FilmRepository could be implemented by an EloquentFilmRepository, and declare only what the app really needs from films: maybe you don’t list them all, as that would kill your server, and you only have a paginate and a find method. Any sample code to drive your point home? You made me curious. Hey! I’m back from vacations and swamped with work. I’ll make a gist when I get some free time! In the meantime, what are you interested in exactly? My point was that reusability through inheritance and sharing types between Repositories wasn’t necessary, but if I were to make some sample code (like suggested maybe with the CrudQueryBuilder), it would look similar to the abstract Repository class implemented here. It’s not that much about the code itself, but about how and when you choose your abstractions, and how you reuse your code. I’m fairly familiar with the pattern implemented here, but I would be interested in a more flexible way to do this, because being constrained to always implement the methods when you create a new repository for a new entity is not very cool, though Mirza’s implementation helps a lot. So when you have some time an example would be welcome. And thanks for answering. So what you are saying basically is that the inheritance should never be used to reuse stuff and be solely used to represent something totally non-generic..in the case above..not to query database. And it seems like you are suggesting to let eloquent classes do what they do best in the concrete class in itself. But does not that makes the whole point of replacable data access layer a moot point? It always depends on context. If we use inheritance to reuse code, we are coupling very hard to that code: we statically couple to a concrete class by inheriting, and we dynamically adhere to represent its parent because Liskov. How awkward could it be to receive an instance of ActorRepository when you were expecting a FilmRepository? Of course this gets solved by type hinting the concrete child where you need it, which makes evident my initial point: there is no real use for the shared type. Now, when I said Eloquent does this best, what I meant is that you don’t need the common ground, because if you look at the proposed abstract Repository, all methods act as a proxy to the Eloquent instance. This is what I also meant when I analyzed abstraction through generalization: this is not a generalization at all. There is no real use case, you are just building Repositories imagining what you’ll probably need from them. And, guess the acronym? Right! YAGNI. If you aim to go the full RAD, fast development lane with no care for architecture and testing, then you’re better off just using Eloquent through Facades, it will get you there faster. If you aim to use the Repository pattern to abstract your data access layer, my point is: you don’t need common ground between your repositories. Implement data access methods only when you need them, and avoid overuse of inheritance when you actually want to decouple. Absolutely agree with you here. I am terrible at putting my thoughts to words, but you’ve just described my personal opinion/findings perfectly. it would be good if you can show us some proper way then like how writer described his point of view in details above? I was looking for info on this pattern and symfony and I read this post. I partially agree with you about simplicity, the idea here however, is more to put together blocks of code that have a common topic. So we are gonna have with files FrontControllers in my case that just redirect calls from the view to the Repository and then to the Model (Entity). Now, I get your point that in some cases this might not be needed and we add one more “layer of complexity” sort to speak. However, think of an application as big as Facebook like the one I am working on right now, and I can guarantee you that having the code as well organized as possible is a desirable thing. The code ends up being more reusable. You end up with more cohesive blocks of code. This is a two year old response, so I’ll try and remember what I was thinking back then. I would never argue against using the Repository pattern, it’s a proven practice that helps projects organize their data access while also representing something in your domain. If used correctly, a repository can actually simplify interaction between domain services and entities. What I argued back then, and I still believe in, is that you shouldn’t take these kind of generalizations and bake them into any project. You should know about them and you should be watching over your code so you can abstract if and when you need to. Most frameworks provide these abstractions anyway, so maybe I’m just being picky. But in my experience, I’d rather postpone writing all of this code until I need it. The best decision you can make depends on the amount of information you have, and being early in the project, you know nothing. Don’t assume you’ll need it. The way this article explains it is very similar to how Symfony implements it out of the box for you. I agree with not writing things until you need them, but some basic things are very unlikely not be be used, like findById(), findAll(), etc. And even if you don’t initially put them in an interface, I’d suggest putting it in the interface as soon as you do create those methods, just to make sure all your repositories stay uniform, and act predictably. My feeling is that repositories become a mess without contracts. Hi, how can you cache result (I’m adding a Cache layer on Repository ) with criteria queues? Hi Tim, can you provide me an example for that? These kinds of articles should really start with a note that explains that the Repository pattern isn’t something everyone should use in all their projects without thinking whether it’s beneficial for their particular situation. There is a tendency for some devs to try to apply every pattern they learn to every situation. So keep in mind that using a repository adds a significant amount of complexity above simply using something like Eloquent directly, especially if you try to completely isolate the model so that all interactions have to be done through the repository. There are situations where you need that separating barrier and you really want a layer of isolation between your business logic and the data source. And the Repository is something that web devs should at least be aware of so they know to use it when they need it. But if your app doesn’t need that separation, adding it for no reason can make a simple app far more complicated than it needs to be. I do agree that using Eloquent directly is far more simple. But it gets really bad when you decide to change from Eloquent to another ORM or don’t use an ORM at all. Please keep that in mind. Personally I prefer make things a little bit harder first so I won’t (possibly) waste a lot of time later. Hi. I’m working on an API and realized recently that we need an abstraction layer for complex queries so we don’t have to use the models directly in our controller. Your repository package has caught my eye and I’ve started to work on implementing it. I’m wondering if there is a way with criteria to pass in parameters? I want to create criteria but I want them to be a bit more flexible, and I don’t understand from the examples if this is possible. For example I’m currently using eloquent scope queries to handle custom criteria. I want to move that logic to my repository through criteria… and I’m not sure if it is possible. in the example I see a way to make a similiar criteria with a hardcoded $id… is it possible to pass variables to the criteria when you apply them? second quesiton: Is it possible to load certain criteria on every load of a particular repository? To do that do I just override the constructor and add criteria there? Yes, you can pass parameters into the criteria constructor method. $this->film->pushCriteria(new LengthOverHours(2)); // Passing variable into the criteria. So, in this case, what would you need “MovieRepository” instead of use always a BaseRepository passing a model? Hey… I’m just reading your article and trying to learn. Just have some question… The laravel ORM is not the same thing? What are the differences? What adventages que have of using this or directly use the ORM in our controllers? Hey @mirzap:disqus, fantastic article and package implementation. Is within the “<?php namespace AppRepositories;"
It should be in "<?php namespace AppRepositoriesEloquent;" isn't it? It's a bit confusing to me. Thanks, this is great, although I tend to agree with Guido Contreras Woda. Also, I too miss request criteria helpers for cases when our business analyst goes crazy and demands that we have a filter for each column in a grid, and then also total count of records before and after filtering. This means running COUNT(*) before filtering, then applying filters dynamically, then adding one more COUNT(*) query. Yack… but business analysts are always right, therefore developers have no much choice. But my solution seems like a quick&dirty hack. It would be great to have some out-of-the box solution done right way with repository pattern. Just a small question: Why does your LengthOverTwoHours class does not implement all methods of CriteriaInterface? Yet your Repositories return Eloquent objects. There is a difference between business logic and application logic. Could not find any business login in the above examples. And, the Eloquent model is returned because it is injected in the repository class. It could return anything we want. It calls the all() method which is Eloquent-specific. What happens if you decide to change your repository to, for example, one that does raw SQL queries and returns POPOs or arrays? Suddenly your calls to all() won’t work. The repository should return anything that is injected to it. If I am using Eloquent ORM, I will inject an eloquent model on it and use it within my repository. Repository::find() returns an Eloquent model object. If I wanted to update that model, why shouldn’t I directly call -> save() on that model? Why should I pass that model to Repository::update()? Should we never touch Eloquent Models directly? // here is where you implement the logic to save. // since Eloquent ORM already does this, we’ll use it. Procrastination kept me from reading this for a very long time while I built something similar, a lot of useful insights here. My approach was a little bit different though. I have this idea that REST Controllers should behave like these Repositories. I used annotations and something similar to this pattern to build a generic abstract controller that a concrete controller can extend. The abstract controller comes with generic routes like find, findById, store, count, delete, … (the usual REST actions) Like this pattern, the concrete controller is required to define a model, but in addition to that using annotations, define a url prefix. Your insights are definitely going to help me improve my implementation. – How would you deal with relationships using this pattern? Hi, I’m now trying to use the repository mode in laravel, but I’m wondering what if I use multiple models in one repository, for instance, by default the PostRepository would only be related to the Post model, but if I would try to fetch a certain user’s posts in the PostRepository, clearly I would need to use the User model to make the query condition, so should I just add a function like getUserPosts() in the PostRepository class and inject the User model to achieve my purpose(fetch a certain user’s posts) or there’re other better ways? 1. Shouldn’t the LengthOverTwoHours extend the Criteria and not implement the CriteriaInterface because it’s defining the “apply” method from Criteria and not defining any from CriteriaInterface? 2. In Criteria you declared “apply” method with params but when declared in LengthOverTwoHours the $repository isn’t used anywhere. Shouldn’t that method omit the reference to the $repository instead? If not, why do you need the reference to that object? I do not know if this answers one of your questions, but the ‘applyCriteria’ and ‘getByCriteria’ methods use the second parameter of the ‘apply’ method of the ‘Criteria’ classes. for example, how can do with this repo in my controller ? Hi, why should I use your package instead of this one? Can we call pushCriteria() two times in controller function? I want reports filtered by message and notification respectively. I got also this problem. Don’t know the fix either. Very nice article! But why is the $app variable needed? Great package! Just cerious, why would you need Repository passed to the apply method in the Criteria abstract class? Also, I recommend extracting the pagenate methout out of the RepositoryIntrface. I would make a new interface and put that method by itself in there “i.e RepositoryPagenateInterface”. Not all implementation need pagination. I followed all the steps but in the end worked only the classes of repositories. The criteria classes did not work, so I discovered that the ‘LengthOverTwoHours’ class was implementing the ‘CriteriaInterface’ interface when it should extend the ‘Criteria’ class. I noticed that the ‘Criteria’ class is an abstract class that represents the ‘Criteria’ class types that are passed by parameter in the ‘getByCriteria’ and ‘pushCriiteria’ methods of the ‘Repository’ class, so I changed the ‘LengthOverTwoHours’ class and It worked. I followed the same logic for the other criteria classes I created and everything works perfectly. I have a specific situation where I need to execute one Criteria over the Repository and after that I need to get some results and call different SearchCriteria over the same Repo. Is there any chance to add something like removeCriteria as oposite of pushCriteria? I have used your pattern is my project, its really very fantastic an time saving. I have a doubt, can you tell me how can i use join queries using this repository? You can use criteria for that. Do you actually require Criteria Interface and its implementations? I would go by creating a bunch of criterias which are simple functions. I may need to group them by class, which is still unnecessary, especially when PHP does not require us to be pure OO, and provides plenty of room for functional programming. Hello! Thank you for this article! Where can I can i read about this method “find” you are using here: “return $this->model->find($id, $columns);” ? There are some problems with your code. The “apply()” method has been added in “Criteria” class and not in “CriteriaInterface” class, so it is not possible to implement Criteria ” class. Could you please help me develop a relationship search for another model (related table)? I think we could do more sophisticated searches using “with ()” method, etc. Hi, just came across this, great pattern, thanks! Just a quick question, shouldn’t the resetScope method of the repository set the criteria collection to an empty collection? Doing this allows for the query scope to be reset on the model instance within a session. Do you have any more resources available to understand how eager loading works within the repository pattern? But how can i do for updating multiple data with Repository Pattern ?